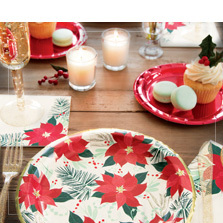 Celebrate Christmas day with everyone and have a party with the most original Christmas decorations! From red plates with Christmas motifs to garlands and Father Christmas ornaments, from gold and silver balloons for your New Year's Eve party to streamers in one thousand and one colours, from inflatable adornments to accessories for a fantastic New Year's Eve photo booth. A great selection of low-price and economic Christmas decorations! 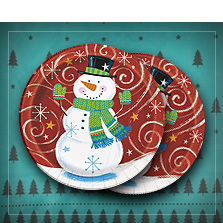 Decorate the walls with snow capped garlands, Christmas tree posters or incredible window sticker decorations. Hang the socks on the chimney and surprise everyone with an original Christmas present. Get all the coolest Christmas outfits and the most original New Year's Eve costume and celebrate the best Christmas of all time! Decorate your house with these original Christmas decorations and leave everyone gobsmacked! Includes: gold candle 7.5 x 15 cm. Includes: silver candle 7.5 x 15 cm. Includes: gold candle 7.5 x 10 cm. Includes: silver candle 7.5 x 10 cm. Includes: 9 Christmas gift tags, 10 x 15 cm. Includes: green garland with 160 pine needle branches, 210 cm. Includes: bag with artificial decorative snow, 60 g.
Includes: Merry Christmas stocking, 70 cm. Includes: red Christmas stocking, 17 cm. Includes: Christmas mail bag, 40 x 54 cm. 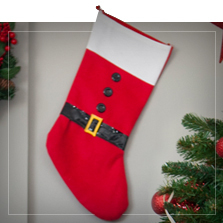 Includes: Santa Claus Christmas stocking with fleece lining, 46 cm. Includes: Santa Claus Christmas stocking, 55 cm. Includes: Santa Claus Christmas stocking, 45 cm. Includes: light up Nativity scene decoration, 12 x 16 cm. Includes: 3 reindeer clips, 8 cm. Includes: 9 clip on Christmas tree decorations, 4.5 cm. Includes: Santa Claus head decoration, 22 cm. Includes: animated Santa Claus figurine, 30 cm. Includes: musical reindeer figurine, 20 cm. Includes: Wood XMAS letter sign with snowman, 30 x 15 cm. Includes: wooden candle box with Christmas trees, 29 x 15 cm. Includes: Santa Claus Christmas stocking, 50 cm. Includes: red Santa Christmas stocking, 44 cm. 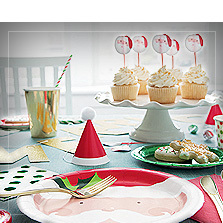 Includes: Santa Claus Christmas card holder, 18 cm. Includes: Reindeer Christmas card holder, 18 cm. Includes: snow-covered light up house measuring 22.5 x 19.5 x 14 cm. Battery-operated. Includes: Christmas village scene in a musical bag decoration with lights, music and motion. 25 x 22 cm, battery operated. Includes: Christmas village scene in a suitcase decoration with lights, music and motion. 26 x 20 cm, battery operated. Includes: Children in a mountain house Christmas scene decoration with lights, music and motion. 18 x 22 cm, battery operated. Includes: Children playing Christmas scene decoration with lights, music and motion. 22 x 20 cm, battery operated. Includes: frosted pine cone with mistletoe, 30 cm. Includes: frosted Christmas decoration, 30 cm.